After I posted the database of livery colours online it struck me this was the first time in years I’d done anything related to one my favourite periods. Then I realised I’d used a typical livery colour scheme to paint some late medieval knights recently. Perhaps my subconscious was trying to tell me something? In the medium term I plan to upgrade my War of the Roses heavy infantry. 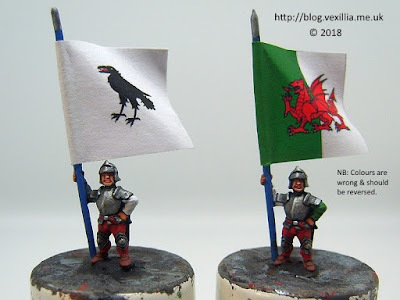 To do this I would like some new livery flags. Freezywater do a couple of sets of livery flags but unfortunately not the ones I want. So it was time to design my own. What follows is a tutorial (of sorts) with a few tips that I hope will help others. My War of the Roses army features the retinues of Henry Tudor, the Earl of Oxford and Rhys ap Thomas. Thankfully the trio’s livery colours are well-known. The database of livery colours lists them as green/white, tawny, and white. According to Pat McGill’s excellent book on livery badges the trio’s badges were: dragon passant (red), boar courant (blue) and raven (black). Luckily, all three badges were available online from the excellent Images for Heralds and it was a matter of moments to switch the image format and change the colours where necessary. A 2 px border round the flag and all major colour blocks but not with black but with a 15-25% darker shade of the main colour. This gives enough definition but is much more forgiving when it comes to cutting the flag out. A special (non-printing) layer with semi-transparent blocks dividing each face in half and showing the section that will wrap round the flag pole. This helps enormously in positioning the badges. Positioning the badges is really tricky because the badges are irregular shapes. In addition to centering, the badges need to be positioned so they look right when the flag is folded. Surprisingly, this isn't always the same as placing them exactly in the center. It took me two or three attempts to get it right and this included mounting a few on test figures. For 15 mm figures my previous attempts at flag design taught me it is important to prepare flags in many sizes ranging from 18 to 24 mm. You never know which size will look the best. The easiest way I’ve found to do this is to import a large image into Word and repeatedly resize it to produce the size variants. I always “print” this Word document to pdf as I use a local copy shop to print my flags using their high quality laser printer but this time I asked for paper without any surface coating. High quality coated paper produces great looking flags but the printed layer cracks far too easily when you try to drape the flag on the model. The uncoated paper is much more forgiving. Select and cut out the right size flag with a new, or very sharp, blade to prevent the paper tearing. Stick the two halves together with PVA leaving a small gap for the flag pole. Bending it round a piece of brass rod helps. Don’t put glue in the gap. Trim the edges if necessary. I never seem to get the edges to line up. Dry fit the flag on the pole and shape the flag by bending it round a paint brush handle to animate it slightly. Do this before the PVA dries and the flag is still pliable. Remove the flag, add a drop of super glue to the flag pole and re-thread the flag on to the pole. Do this quickly and firmly. The super glue will not give you a second chance. Paint any coloured edges taking care to match the colours. Please note I have taken some liberties with the livery of Rhys ap Thomas's flag bearer giving him a halved black and white jacket. All white is just a little too plain on the table (and impractical in real life). It is loosely based on his coat of arms which features a large inverted black chevron on a white field (and three ravens). I should have added that Rackham Color's Diisha Green is a perfect match for the green on Henry Tudor's livery flag. I don't like using it for painting miniatures due to its low adhesion but it works really well on paper. Update: It's been a very long time since I dealt with livery coats & flags. 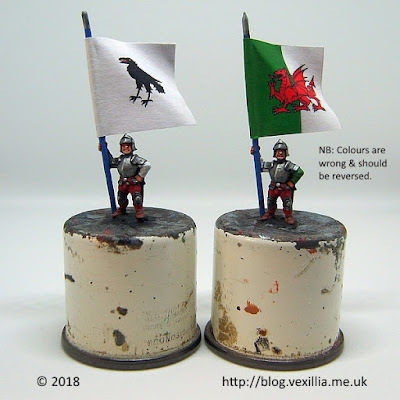 As a result the flag for Henry Tudor had the green and white the wrong way round. I have changed the flag above and annotated the pictures. Good job they were only test pieces. PS: The livery coat colours are correct.